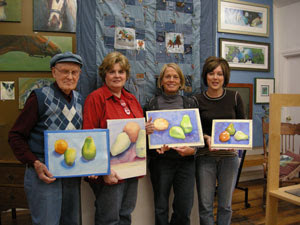 I teach a Drop-In Watercolor class nearly every Friday morning. Last Friday we worked on developing hard and soft edges and used a still life set up for our subject matter. I think the thing I enjoy most about teaching is that even though many times we are all working on the same subject, with the same colors, and working step-by-step together, every piece of artwork is different. Each piece shows the student's style and personality coming through. Thanks to my students for posing for the photo!